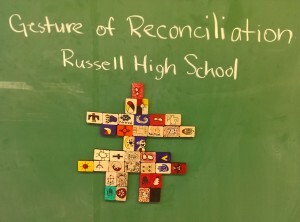 Miss Hétu’s Grade 10 Native History class at Russell High School in the Upper Canada District School Board completed Project of Heart in mid-October 2014. This was the the group’s first time participating in Project of Heart. Each student selected which Residential School they wanted to learn more about and focused on that school for the Project. For their social justice action initiative they decided to sign up with Shannen’s Dream and will support their campaigns. As a gesture of reconciliation the class chose to do a tile commemoration. They put magnets on the back of the tiles to make them stick to the chalk board. 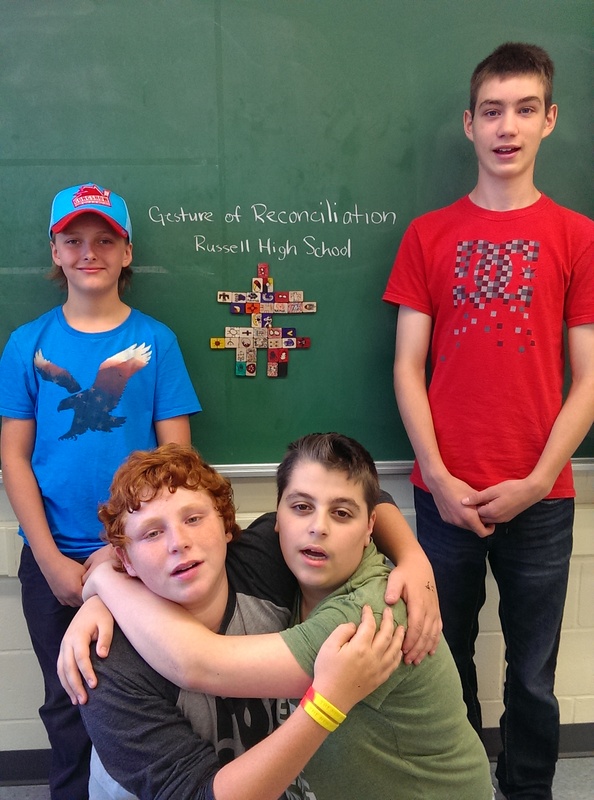 We placed in the form of an Inukshuk – as one of the most recognizable symbols of Inuit culture. The “Children to Children” art installation by artists Shirley Horn, Shelly Fletcher and Zenith Lillie-Eakett was created as part of the “Project of Heart Commemorating the Children for Future Generations” initiative. 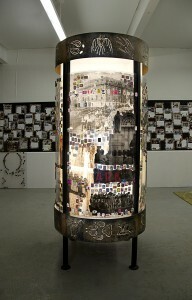 The initial unveiling of the installation was held at 180 Projects in Sault Ste Marie, Ontario in December 2013. The permanent installation of “Children to Children” at Algoma University took place in August 2014. Shirley’s final design took the cylindrical form of the drum and abstracted it to the point where it now exhibits the form of a round billboard. “ Billboards reflect history, past and present, they proclaim, exclaim, and tell a story, much like our drums.” The material chosen for this piece is rusted steel because the weathering and rust conveys not only beauty but resilience through the passage of time. 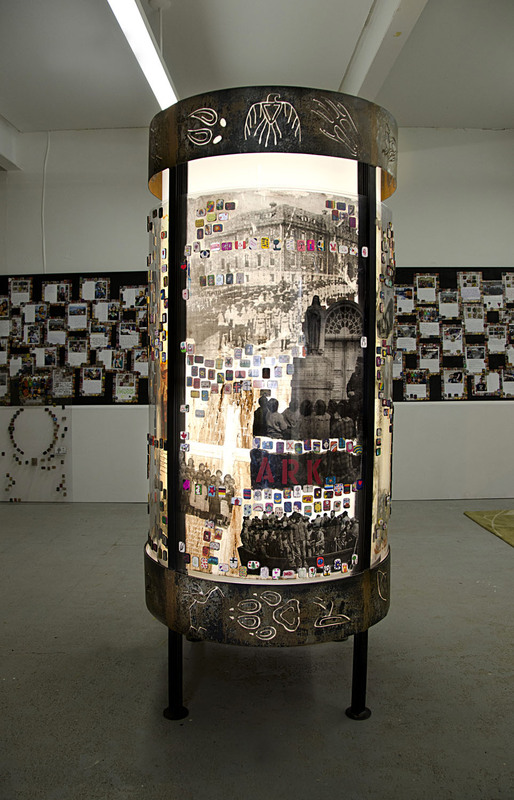 While not a welder, Shirley has contracted a local steel fabricating business with her design, a tall round steel framework into which transparent layers of plexiglass with artwork on them that will be inserted vertically into the four quadrants. 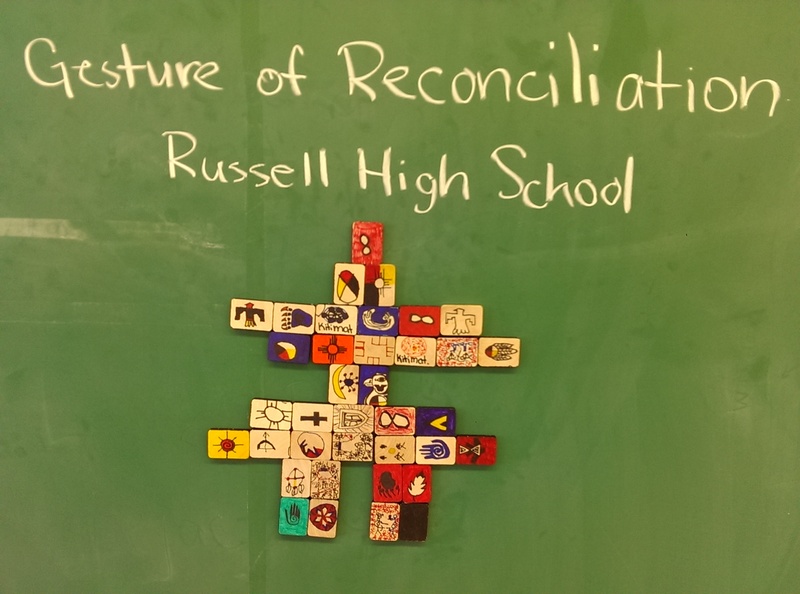 Each panel or quadrant tells the story about the residential schools graduating from the past and into the present. . Additionally, the tiles will be seen within the artwork on the panels and throughout the room surrounding it. While they acknowledge the devastating effects of the legacy, Shirley, Shelly, and Zenith want to convey instead, a sense of growth, a bright future, and an affirmation that the children who did not make it home from the residential schools will always be remembered and that they did not die in vain.